Do you find content creation challenging, even intimidating? In this episode, repeat guest Kyle Gray and James Schramko talk about how content marketing needn’t be the Herculean task some business owners perceive it to be. 18:34 – What should your content look like? 29:59 – How tuned in are marketers to empathy? 39:14 – How do you stay on topic? James: James Schramko here, welcome back to SuperFastBusiness.com. Today, I have a special guest back for his third visit. In the previous iterations, we talked about, in Episode 451, How to Find and Train Your New Content Manager. And in that episode, we talked about finding a medium that suits you and we talked about simple processes you can use to get content out on your website so that people find you. And in Episode 457, we talked about leveraging guest content. We revealed the fact that you can’t be a master of everything, and you need to get some external resource and pair that up with your content and really power up your campaign. So today, we’re actually talking about how to succeed in content marketing without spending all day writing. We’re going to continue developing this topic, and I would love to welcome back my special guest, Kyle Gray. Kyle: Thanks so much for having me, James. It’s a pleasure to be here. 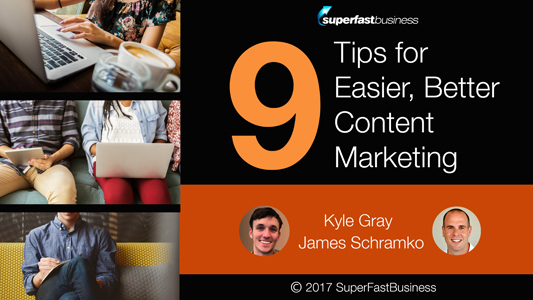 James: Kyle, you are an entrepreneur, you’ve been helping startups and small businesses grow with their content marketing especially. And you’ve been creating scalable content marketing strategies. I think that’s important, because when we initially hear about blogging or content marketing, I’m sure we have this vision that we’re going to be sitting there with a blank screen, thinking about what can we write. I’m sure most people’s campaigns stop right about there, before they dive back into their email, grab another course or hop onto Facebook, and it’s all finished. What I love about what you’ve been doing is you’re good at creating these step-by-step processes and templates that have been helping people automate and delegate what they’re doing with their content. And you’ve even been teaching entrepreneurs and startups in places like the University of Utah, where I think you’re currently located. But you do tend to travel around. Right now, though, you’ve parked yourself for more than five minutes so that you can do this podcast. Kyle: Definitely. Yeah, it’s interesting to see how many different perspectives all kind of collide when people are thinking about content marketing. One thing, you hit the nail right on the head where a lot of people have this kind of artist’s view where they kind of imagine, yeah, sitting down in front of a blank screen and just being like, “Alright, I’m inspired. I’m going to write something today.” And then there’s that, and then it also collides with a lot of the other kind of turns and philosophies of the digital marketing world, where people use a lot of the same ideas like conversions, copywriting, all these kind of things, and with content marketing. So a lot of people would almost use the same words for creating a good Facebook ad as they would for content marketing. And that’s funny how, yeah, there’s kind of this artist’s and this kind of marketer’s perspective collide in this medium. And I think it makes it a really unique place to play. James: Yeah, I think it’s fascinating as well. You’re talking about a sliding scale of like the extreme left and the extreme right there. You’ve got these amazing bloggers and artists who can write beautifully, they can tell their stories, it’s imaginative, it takes us this long process. I read about it, or I hear about it in other people’s content where they’ve got content planner schedules, they write for eight hours in a cafe, they do these epic blog posts. I’ve rarely sat down and written anything until most recently, because I definitely came to it from the business-ey marketing side where I was a business person looking to get my message across to my target audience to help them understand that I know about their problem, that I have been exposed to the solutions that could help them too, and that I want them to take a form of action that will help them. And that’s how I approach the content marketing. It’s only recently as I’ve been developing my palate for storytelling, I’ve been watching all sorts of TV series, I watch lots of movies, I’ve been listening to journalists about podcasting like Ira Glass. I’ve been influenced by friends of mine like Kelly Exeter, who is really into that story and transformation side of things. She’s been helping me put together my own books. And that creative, artistic side’s coming into it now. So I think when you have the fusion of good art and creativity, but in a very strategic and business-like delivery system, you’re going to get huge results. Would you say that that would be the case from where you’ve seen it? Kyle: I think that definitely is the case. And I think a lot of people, at least a lot of the companies that I’ve seen, working with content marketing, you know, they have the strategy and they have the artistic. The thing that seems to be missing a lot of the time is if you have both those skills and you have a growing business, it’s really hard to balance. And even if you’re a master content marketer, a master writer, writing is still going to be hard. And writing is still going to take a lot of time. Or any kind of content creation is still going to be challenging, whether you’re Ira Glass or whether you’re just starting out on your first blog post ever. And so that’s really where a careful third element of balance is in here, where you do need to have a good marketing chops, good understanding of how to strategize your content. You need to be creative and authentic and have an interesting story. Fortunately for most businesses and most people, I think if you’re able to get a business off the ground, and if you have a good B2B strategy or a good productized service, there’s usually, most people have really good stories just kind of built into their lives that they know how to extract them and then frame them up in a way that’s interesting to their audience. But a lot of people have stories that are just waiting to be told. James: Right. I remember being told to create a story inventory, to write down my stories. And as I’m finding some of my old notes from decades ago, I’ve discovered some of the stories I wrote down are funny things that my kids have done, some milestones in my business career, I wrote down those things. And lately I’ve been collating them into what I call a concept register. And it’s like, where I find stories that really hit home a point. I write it in my concepts register, and that is the seed bank, if you like, where I grow my ideas out. And that’s been the basis of the books that I’ve been writing lately, is to go and grab some concepts that came about through a real-life experience, and then to develop the story around that in a business shell. Kyle: I think I’ve seen you, or I’ve observed you at least via social media, going through this process. Because I remember a couple of weeks ago you posted lined paper written out with kind of your goals from 10 years ago. And I see so much story in there just kind of, you know, seeing what you were aspiring to then and what you’ve created now creates incredible things. And again, like you know, just looking back one year or ten, yeah, there’s plenty of seeds for that. And I think that that’s having a good place to collect all of those ideas is totally essential. I think most people, who talks about this a lot? Elizabeth Gilbert talks about kind of the playful way that ideas and inspiration seem to strike us usually not when we’re ready and sitting in front of our computer. And so having a little way that you can collect those ideas and put them together into something that you can reference later is a super powerful tool. Can’t spend all day writing? James: Well, one thing that was confronting was when Kelly asked me to write a chapter around each of the stories that we selected. I found that a blocker. I was there with my writing scratch pad, and I’m not someone who would classify as a writer. So I found that being the hard part. That was the objection, and hence the episode title. I couldn’t sit around, spend all day writing. I did write from my head a series of emails which were the seed of the first book that we’ve been preparing. And those came straight out of my head into the keyboard from I don’t know where and I’ve never done it before. And I found it harder to do afterwards when she asked me to refine it. The only way that I found to break that cycle was to actually jot down a page of bullet points and then just talk into my phone, which I recorded and then I uploaded it to Trint.com, which transcribed it all. And then I was able to dump that into my scratch pad and just edit my own words. I found that process finally unlocked my hold back with sitting down and typing. It was based on good theory that I could start with some good ideas that needed to be talked about. I could talk about them, because that, as we talked about in our previous episode, is the medium that suits me. Then I was able to transform them into words which could be polished up and edited. So I think there’s something to be said for this fact. You do not have to spend all day writing, but you can still end up with a whole bunch of words. You know, just in a conversation or just even talking on your own and kind of listening to yourself and working through your own ideas, you know you don’t have those same blocks. And then if you can just get it recorded in audio, then yeah, there is a lot better ways. You can hand that off to a writer to transform it into a post, It doesn’t have to be exactly transcribed. And in fact, I like it better when they take the ideas that were discussed and then kind of put it into the medium of writing as a nice informative post, not as not as a kind of a write-up of an interview or anything. And so I think that’s one of the most powerful ways and I know Chandler Bolt recommends that same tactic and I think he uses that himself to come up with a lot of his books, and teaches that in his self-publishing school course, which you know, if you know him he’s like, he’s got five or six books out now. He is just insanely prolific and I think it’s all about, yeah, he just writes most of his books by talking into his phone recorder. James: Yes, I certainly know Chandler. I coached him for a while there. So he’s had stratospheric growth. And I met him at a live event where he had already published his book. I think it was around productivity of some kind. One of the earlier ones. And he’s really just gone leaps and bounds. Now, interesting point about your chat with me where you recorded and turned it into an amazing post, which I can link to in the show notes from this episode. I actually took my side of the recording, gave it to a team member, and asked her to extrapolate that into some bullet points, which she sent back to me and then I turned it into an 11-minute video which is actually Episode 527, Advanced Event Planning Tips. And I published that in early March. That was my process, was to take an external stimulus, somebody else asking me about my story, capturing it, repurposing it into the digest, and then turning it into a different media type, in this case a video, which ironically we fully transcribe in the post as well. So the seed of that idea came from somebody else asking me to dig into my story box, into my experience box. So the tip there is if other people are interviewing you, record it and get someone to go through that recording and find the bullet points and then use those bullet points for a new piece of content. And I found certainly it’s easier for me to rework the core of something than to come up with something from scratch. Kyle: Definitely. Yeah. And I think that that’s truly the beautiful process. Those are the kind of systems that I love to set up and figure out how we can get running smoothly. Just the seed of one idea you know, flowered into multiple different pieces of content. And what’s awesome is you have your team that’s able to take what your strengths are and then leverage their strengths to translate it into a lot of different formats. James: I absolutely love my team. We’ve talked about finding and training your own team. I think that if it’s a core traffic and conversion strategy for your business, which it certainly is in mine, that investment of having a small team is like building a machine that delivers over and over again that you can then feed into it great ideas. So one example is right now, at the time of recording this, you’ve published a book called The Story Engine and now you’re able to come along and talk about some ideas in that book in different versions. We’ve got this podcast format where we can cover some of the key concepts. And no doubt, you’ll be publishing your own material as well and appearing on other places when the book comes out. And I think that’s scalable to the extent that you have available time, you’ve got to turn up for some of that. And then it’s a lot to do with your delivery mechanism like where can you get distribution. So I know that some of these concepts are covered in your book, The Story Engine. 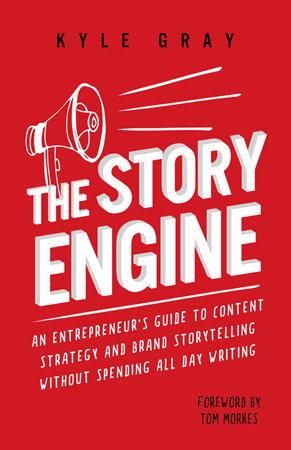 By the way, you can go along to thestoryengine.co and find out about that book. I recommend you grab the book. Let’s talk about some of the foundations of good content. What would a good marketing campaign look like? And if we had some bullet points we’re going to take from this, where do we start? Kyle: So there’s a couple of fundamental pieces that I like to work with with my clients and any time I’m starting out a new content marketing endeavour. And the first one is just having a content strategy and having it written down. A lot of people, I find most people say they have a content strategy, but they don’t have it written down anywhere and they’re just kind of, it just kind of exists verbally and they can tell it to you one day and then you can ask them again the next day and it’s a little bit different. And I think it’s so important to have it actually written down because it keeps it consistent. It keeps your biases and whatever shiny object is on your mind at the moment from altering your strategy and it keeps you consistent. And it also creates something bigger than yourself by writing down your strategy by focusing on like what is the mission of this blog? How is somebody going to come away with more value? How do I want to help people or make an impact on the world or my industry or on a certain problem? And by creating this big picture, it creates a foundation for you to bring more team members in, whether this is writers or other marketers to help you promote the content, or whether you’re just working in a start up and you want more of your team members involved. This could be somebody in customer service that doesn’t really create any kind of content at all. But if you can hand them like, this is our strategy, this is what we’re trying to do here, they’re going to be able to open their eyes and start seeing, OK there’s cool opportunities here. I just had this phone call that kind of speaks to this and so it allows you to have your blog existing outside of your own head and your own ideas. Secondly, I think a style guide is really important and this is specific expectations on what you want your content to look like. For me, I work with written content a lot so that’s drilling down and getting really specific on how many pixels wide do I want my images to be? And do I want to use H1 or H2 headers to divide up my posts? These may sound kind of frivolous or nitty gritty, but when you start to work with a bigger team, when you start to have multiple writers, multiple creators all working at the same time, these little details become incredibly important for creating consistency. And I think consistency is one of the most important and kind of under-noticed aspects of content marketing where people see and subtly, you know, they may not actually notice, like hey, this header is in sentence case where only the first letter is capitalized and this next header, each letter is capitalized in each word. They may not actively notice it but I think that it’s very important for building trust, even if it’s very subtle things. James: Right. I think design seems to have finally emerged as being important. We’ve gone past the point where marketers are saying ugly sells. You know, I’m not buying that at all. I think if you can have a beautiful design, I’ve seen some pretty thin content get popular even though it’s not meaty. It just looks pretty. There’s a lot of pretty marketers who sell well but have no real content to speak of. There’s nothing behind it. So gosh, if you’ve got really good stuff and it’s presented well, then that can help people consume it and enjoy it more. Right? Kyle: Definitely. And it’s presented well and you want it to be presented well whether you are creating it or you have a team member creating it or you’re hiring a new freelancer. And if you have a good style guide in place, you’re going to get a consistent result no matter who’s behind it. James: Nice. We’ve just been going through a process of internal training for our team on our podcast style guide, which is how we mix the tracks and put the intros and tag the medium where we publish it so that every episode, especially ones like ThinkActGet, have the exact same musical anchors in all the parts where it matters so that the consumer is getting a consistent experience. It’s the same way when we turn on a new episode of Game of Thrones. We hear that intro music and it just sets us up for the show. We get ready for it because we get so tuned into that starting thing. Kyle: Definitely. And I can’t wait for that by the way. James: Yeah, it’s pretty, pretty good and good storytelling too, isn’t it? Kyle: Absolutely. I think what I like about that is everybody kind of, there’s no, actual, maybe there’s one good guy in that show, but everybody is kind of not exactly a good guy and not exactly a bad guy. And I think that that can kind of apply to a lot of what people do with their content marketing in a way that is telling your whole story and kind of sharing your flaws a little bit and kind of talking about some of the darker times or some of the mistakes you’ve made along the way. A lot of people, you know, it’s very scary to do. And in fact, usually the posts where you start to get a little bit vulnerable, get a little bit nervous and kind of show maybe a mixed history, not all perfect success but some of your struggles, some of your mistakes, some of your fears, those just like a Game of Thrones character, which some of the people that I love that have these both good and bad and these visceral struggles that you can really identify with, you can create that same effect just by being open and transparent and vulnerable in what stories you tell and how you share your brand and your company and the story line that you’re creating with your business. James: That made me think of Chandler Bolt again who’s been sharing his struggle with poison ivy on a Facebook post. Kyle: Oh man. Poison ivy is the worst. James: I don’t have any direct experience with that. It’s not something that the more sort of older school business people do, is like share these personal traumas and dramas and you know, it fascinates me. But it’s so sticky and compelling to audiences when someone’s going to just out of left field. He’s a successful business guy but he’s just breaking down his personal battle with how to solve this poison ivy problem and so forth. So I do see that trend that you’re talking about, more vulnerability coming from the next generation. Kyle: That’s hilarious. I have seen his success with that too. And I doubt he was actually like trying for this as a marketing play but he was really seeking help. Because I had it last year and it was a minute-to-minute battle for sanity. James: So what’s the next component that we need? And I think it had something to do with relationships. Kyle: Yeah. I think that before you start just creating content, I think that it’s important to do some good research on the industry or the niche that you’re working in. Who are the thought leaders? Not necessarily just your direct competitors, but maybe people that are in kind of parallel businesses to what you are doing and writing down who they are, what they talk about and maybe coming up with some ideas on how you can collaborate with them. And so instead of just basing your content strategy off of what fresh ideas or what fresh stories do I have, start to look at your content as an opportunity to collaborate with new people. And so this can be a very simple document of just like this is the name of the person, a brief description, a link to their blog and maybe some comments on your past interactions with them or what you talked about. And this can serve over a super long period of time where if you are creating a post about a certain theme or a certain category, you can think of, who can I reference or who can I reach out to? Who can I talk to? And just by having a list of these relationships written down and documented, it allows you to start reaching out to other influencers in the space. And I think a lot of people overlook this early on and a lot of people end up only talking about their own businesses and their own products and maybe some stories about how customer X was super, their life was changed with your product. But they never really mention any other people. And early on when you’re when you’re trying to get traction on your SEO, when you’re trying to get some social media shares, when you’re trying to get your content sent out to email lists, it’s going to be really hard if you’re just talking about yourself and you’re just doing your own thing. If you can find some key relationships to work on, to develop, to collaborate with, maybe starting small, maybe starting with one of the customers that you know or a friend of yours and then slowly moving up kind of the food chain in your niche, in your industry, then you’re going to start to leverage the brands of others to help promote your own. But you’ve got to do that in a way that makes the people you’re working with look good and excited to work with you. And so that’s kind of the foundation of key relationships. James: Well I think you’re good at that. This is your third appearance back on this podcast. You’re walking the talk. Kyle: Definitely. And this has always been my favorite part about content marketing actually, is thinking about, ‘Oh, who can I have a cool conversation with? Who can I get to know? Who can I meet?’ And a lot of these ideas for content that I come up with are actually from finding a good way that I can collaborate with somebody interesting and that would serve the audience I’m working with. 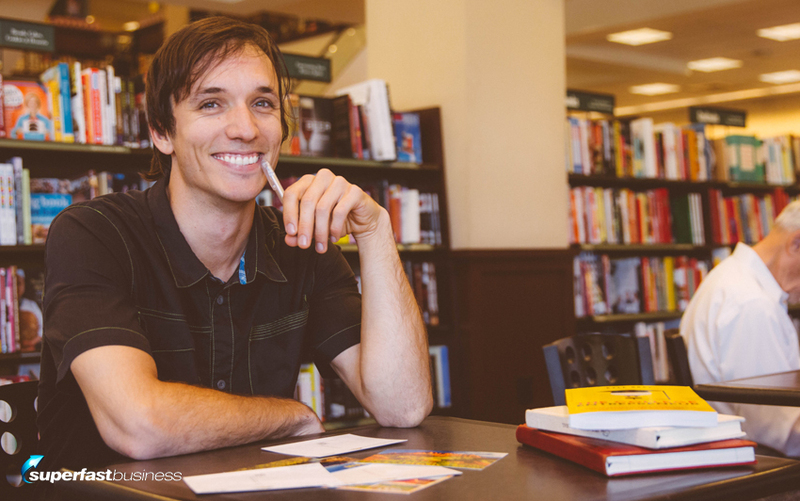 James: When it comes time to publish a book, I’m sure these relationships are useful for you. What’s been the single most successful outreach collaboration that you’ve done? Kyle: So I’ve done a lot of different collaborations. One of them right now, I’m working with this company called Advance Your Reach. And I’ve been able to attend a lot of workshops that they’ve been putting on about speaking on stage, getting booked at different stages and different conferences and creating a business structure that allows you to benefit from those speaking engagements. And at these workshops, I’ve met a lot of different people who are paying customers of Advance Your Reach, and who have their unique stories and unique businesses. And I’ve been able to reach out to a lot of them to collaborate with them on creating some great content and that I’ll publish it on the Advance Your Reach blog. But still as a result, I’ve met somebody, I’ve been able to publish some content that makes them look good to put them in front of the Advance Your Reach audience in a new way. And now they know me and I can reach out to them in the same way and say, “Hey, if you like these systems or these strategies, check out this book. I’ve written all about my process and how I do this.” And so I’ve been able to find and connect with a lot of interesting influencers just through working through different content and collaborating with other people. James: So it sounds like some of your skill sets are curiosity, bravery, like confidence to reach out and have a conversation with people, journalism; you’re documenting as you go and then you’re curating and creating works that can then form a foundation for you to leverage off for the next iteration of that. Kyle: Definitely. And I think another key is empathy. I try really hard to always focus on how can I add value to the person I’m collaborating with and how can this add value to the audience. You want to be really in tune with how all of that works over a long period of time. Not how can these ideas be applied and built upon or how can we keep adding value and keep moving each other’s needles forward? Because I think that’s really one of the best things about digital marketing or just doing business online is it seems like it’s not, in most cases, it’s not a zero sum game. The pie can get bigger for everybody. You know, me, us collaborating, we both gain and we both benefit. Nobody is losing from it. James: How tuned in do you think a lot of marketers are when it comes to empathy and that customer value? I’ll give you a specific example. I saw a marketer post on Facebook recently that if someone hadn’t bought within a year they owe him because he’s sick of giving them freebie emails and he got a little bit of a reaction from that. I certainly introduced him to the concept of pre-eminence by Jay Abraham where he talks a lot about empathy for customers or actually clients and having that duty of care to look after them. And I also mentioned that some in some cases it will take people years to listen to my podcast and then eventually buy some, but I don’t begrudge the people who are on my e-mail list and they certainly don’t owe me anything. And this marketer then turned around and tried to pretend like he was joking after he had so much egg on his face and he looked like such a giant douche nozzle that he tried to turn it into a retrospective joke and then resorted to belittling and talking down the people who were trying to help him with some good suggestions. Do you think that type of marketing is the exception or the norm? James: He won’t. He’s got so much arrogance. I won’t see what he does because he’s been removed from my Facebook feed. I don’t waste time on people who once they realize there’s a mistake, they double down and start pulling out knives instead of admitting it. I think it’s a sad situation for that person. He’s obviously deeply flawed and can’t get past himself. I thought it was extraordinary because I can’t imagine top level marketers still have that kind of approach where, I call this like the baby fur seal method. You know, they’re just like clubbing seals to get a fur coat rather than harvesting grapes to make a wine. They don’t have a long term approach. One year, it’s not really a long timeframe in in business. I like to think more like 10 years. You can achieve a fair bit in a decade. Look at guys like Gary V and so forth. They can do a lot in a decade or two decades, a significant amount. Kyle: Definitely. And I think the story, I think this person you’re mentioning is probably one of the more extreme examples of this, but this kind of goes back to what I was talking about with one of the big flaws or big mistakes people seem to make with content marketing is they mistake it or they mix a lot of the terms, and the strategies, and the philosophies of a lot of other digital marketing approaches and creating a Facebook ad that leads to a sales funnel that leads to an email automation that all kind of happens and you know your ROI and you know your PPC and your cost per acquisition and all of these kinds of things. That’s an excellent and powerful way to do things. But people take these same ideas of what makes a good Facebook ad and they try to apply it to what makes a good blog post or what makes good content. And they’re really focused on, exactly what you were saying, they’re focused on conversions. They’re focused on sales. And that’s why you see, you show up on some blogs and you get blasted with popups like I’ve seen some blogs that literally have, they have so many popup apps that a popup happens and then a different pop up happens and you click out of both of those. And if you still have the sanity to stay on the website then a little extra corner will appear and then you’ll get the exit popup on your way out. And sure, I’m sure that boosts conversion rates. But is that really, are you really adding value to people? Are you really making an impact in the long run? I like to think of content marketing, or though you can’t really measure this in the long run, or maybe you can measure it in the long run but not with a Facebook tracking pixel. But I think that a good conversion to aim for when creating content and when thinking about creating content is just: is this information or will somebody be able to take this information and apply it to what they’re doing and get a result? I think if they can get those things, if they can get a good result from ideas that you shared with them, then that is a conversion, you’ve built up a relationship and you’re expanding from there. I think there’s a lot of hidden kind of value in content marketing that you’re never going to be able to track with a Facebook pixel that’s absolutely, equally as powerful as an excellent sales funnel or a good sales team. And those are things like maybe these people haven’t purchased anything from this person in a year. But what if some of these people are sharing their blog posts across the internet? What if they’re leaving comments? Like saying, “Hey, check this guy out.” What if they’re an amazing hidden affiliate for you? And you didn’t even realize it because you’re like, ‘This person hasn’t bought anything.’ That’s awful. James: That’s how I actually found Dan Norris. I got a keyword alert, a Google alert, and this guy had made a YouTube video about my product, saying that it’s really good. I think it was TrafficGrab. And when I checked it out, he was just making a video saying it was really good. He wasn’t an affiliate. He didn’t have an affiliate link. He wasn’t promoting it for commercial gain. He just thought it was good enough to make a review. And that’s how I discovered Dan Norris. And years later, he went on to create some pretty cool stuff, ranging from WordPress website, which I’m pretty sure you’re familiar with, having worked there, and a brewery of all things. So you know, these little seeds can start out. I wouldn’t worry too much about trying to have a direct response tag on every single person that comes in contact with your content. But you know, my goal certainly is to move people, to have an impact. I love it if they’re driving along somewhere or walking the dog and it puts a smile on their face or they get a great idea and they go back and they’re inspired to do something, that’s fantastic. I mean that’s part of why we do this. That’s what I love about this particular medium is that once you record something, it’s leveraged for thousands and thousands of people can access that same piece of content that takes us, let’s say, one hour to create. We can leverage that into 5,000 hours of value. Kyle: And the value comes back to you in ways that you can’t understand or anticipate. Speaking of Dan Norris, Dan Norris in the comments of one of his blog posts on the WP Curve blog, he was talking about, is startup validation bull**** or not? And this resonated with Alex McClafferty who ended up becoming his co-founder as a result of what they had in the comments section and that in itself is an incredible story. But if you follow the whole story line of WP Curve and figuring out, Alex was super important near the ending stages of finding a buyer and negotiating the sale and putting that together. And so through one comment, through more of a generosity philosophy of creating good content, not just going for a sale or a conversion, what an incredible reward he has gotten from it. It was a big part of how WP Curve became so successful and fundamental to its sale and exit. James: It’s like when I was having a chat to Chandler and I complimented him on his book and asked him if he’d like to get on my podcast and talk about it. It really started a big publicity fire for him and then more books later and some coaching and away he goes. So I love seeing these things start small. So the big lesson there is relationships can be valuable even if they’re invisible. You may not see the impact that you’re having, but if you are doing good content marketing, you will have an impact and there will be something from it. How do we make sure we stay on topic with our content. You got a technique for us there? Again, there is a good way, and this is kind of part of your content strategy, but what I call this is the core problems philosophy. I think that this helps in a lot of different areas and a lot of different stumbling blocks for content marketers. And so what I like to do is think about the audience or the ideal customers that I am trying to reach and come up with what I call core problems, which are problems that aren’t necessarily what your business or what your service solves but they’re problems that the people that you want to speak to have. These problems should be broad enough that you can write content endlessly for but they should also be specific enough that if you start talking about it, they know immediately that they have this problem or not. And so for example, since we were talking about WP Curve, a business that does WordPress fixes, we did talk a little bit about WordPress fixes but it was not nearly the central focus of the blog. It was, if we know that if a customer is coming to our site wanting WordPress fixes, they’re probably a bootstrapping entrepreneur. So what do they need? So they need to talk about content marketing because that’s an excellent bootstrapping strategy. They need to talk about business growth decisions. Should they hire here? Should they get a tool to automate there? Can they hire an outside company to handle this problem? And so by picking out a couple of these different core problems and then using them as category systems for your blog, it enables you to really front load a lot of the work. If you understand a core problem then you’re able to come up with a lot of different ideas. You have at least a little bit of a constraint and a little bit of a framework to work with. Also, you can use these core problems to find a lot of different influencers and a lot of different potential relationships that you can build with. You can create downloadables and lead magnets and lots of extra bonus content for your blog that applies to a wide variety of posts and a wide variety of content instead of just coming up with one blog post at the time and reinventing the wheel for each one of them. You can even do keyword research based on a series or based on a core problem and come up with lots of different keywords that you can just pick from like you’re picking from a menu that are all pre-researched and then add them into the content as you go instead of trying to come up with a specific keyword for a specific post finding its own download and bonus and then maybe coming up with somebody that you want to quote or reference or collaborate on. And I think that the core problems philosophy is something that is really exciting for me and I think it opens up a lot of doors for different marketers who are looking to really scale up their content marketing. James: I suppose it also gives you the hooks to go and research to find other people who are in the places you need to be and having similar related conversations like in the same watering hole where all your animals go and congregate. So using tools like Buzzsumo and so forth in SimilarWeb. Using your keyword bank, you can get breadcrumbs as to where are the other people hanging out in your market. Kyle: Definitely. And I think what the best part about that is usually you don’t have to talk to your direct competitors if you’re working with these core problems. Again, maybe there is somebody that directly addresses the core problem that I want to solve, it’s not part of my business solution but it’s part of my content strategy. And so I can reach out to this person and collaborate with them in a very non-threatening way. Whereas, if you only want to reach out to somebody who’s like doing exactly what you’re doing with your business, then there’s going to kind of be an awkward tension between the two of you. But this core problems philosophy frees you up to connect with a lot of different people that still have your audience that still speak to your audience but you both can can benefit from collaboration, from creating content and from working together. James: This has been really cool. Kyle, I’m going to ask, is it possible that you could come back and do another part to this episode? Because we’ve covered so much turf already. You’ve already given us a good framework. We’ve got a content strategy idea. We’ve got a style guide idea. We’ve got the key relationships idea. We’ve got the keyword bank idea. But there’s still more that I want to ask you about. I want to talk to you about the different ways people approach their content marketing and how to cut through in such a noisy world. Do you think you could come back and share some of those tips with us? Kyle: Absolutely. Let’s make it a plan. James: All right. So I’ve been talking with Kyle Gray. He’s got a brand new book out called The Story Engine at time of recording this. You can check it out at thestoryengine.co. Be sure to tune in for the next part of this particular topic – How to Succeed in Content Marketing without Spending All Day Writing. We’ll see you in part two. Thanks for catching up with us, Kyle. Kyle: Thank you James. It was a pleasure. Thanks Pauline! I appreciate you sharing your key takeway! It’s always good to know what is resonating and I am excited to hear how you take these ideas and apply them to your own business. Keep in touch! The one tool that is making a big difference to my ability to blog more regularly is Writally. It gives me a structure I can follow paragraph by paragraph, so I don’t go off on a tangent. I’ve recently been diagnosed with Bipolar 2, which explains why I struggle so much to focus atm. But with Writally I have started writing again as the recipe walks me through the story telling process. Catherine that sounds like an incredible tool! Wow Catherine! I have never seen that tool before (https://writally.com/). It looks like an excellent resource and I can see how it would make it much easier to create good content.